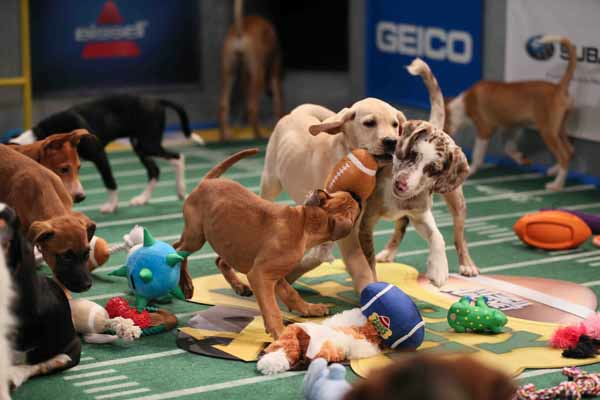 Celebrity Extra: Puppy Bowl X!! (New York, New York, January 2, 2014) – Let the tailgating begin! The most anticipated – and cutest – sporting event of the season is about to get even bigger. PUPPY BOWL returns to Animal Planet to celebrate a very special anniversary in a championship battle for cuteness and barking rights on Super Bowl™ Sunday, February 2, from 3 - 5 PM (ET/PT) and repeating all day and night with exciting new content every hour. And this year, all six airings of PUPPY BOWL X will surprise viewers at the end of the game as fans vote in real time for which puppy will take home the coveted title of MVP (Most Valuable Puppy). With 12.4 million viewers last season, Animal Planet has upped the ante with all new features and guest stars to make PUPPY BOWL X the biggest game ever! And on game day, 66 rambunctious pups itching to score and show off their signature moves and chews in the end zone will duke it out for their chance at glory. Fantasy Puppy League – Later this month at AnimalPlanet.com/PuppyBowl, the network will launch its first-ever fantasy draft, where fans can view profiles of 11 all-star players and create their team of fierce and fuzzy competitors in advance of the big game. Then on the big day, fantasy leaguers can keep track of how their athletic fur balls are doing with live stat updates on screen and a leaderboard online. Penguin Cheerleaders – Every PUPPY BOWL deserves its silly cheerleaders, and this year a parade of penguins will waddle and cheer from the sidelines. Xtraordinary KITTY HALF-TIME SHOW – Super Bowl™ half time has nothing on PUPPY BOWL as Internet sensation Keyboard Cat lends a paw and performs his rock rendition of Bruno Mars’ “Locked Out of Heaven.” Thirty kitten all stars, representing the pride of the feline world, pull out all the stops to put the fans on their feet with an epic domino topple and one little daredevil, which makes a grand entrance by parachuting onto the field. Xtra Special Guests – Keyboard Cat isn’t the only celebrity fascinated by all the action. Animalist’s Lil BUB checks in throughout the game from her Chicago studio, and furry first responders representing police dogs across the New York region take to the field for the National Anthem. Adoption Updates – Stay tuned until the end of the game to find out where your favorite pooches are now. Over the last nine seasons, hundreds of orphan puppies have appeared in PUPPY BOWL and have all since found their fur-ever homes! Dog Years: Life After Puppy Bowl takes a look at some of those lucky pooches and their new adult lives. And in Pup Close and Personal, follow select players home for an inside look on their journey to the grand gridiron. MVP Interactive Voting – Visit AnimalPlanet.com/PuppyBowlMVP on game day to vote for the top pups having the most impact on the field. At 3 PM (ET), the poll goes live, and viewers will directly affect a new ending of each broadcast by helping crown the MVP. Top X Lists – Many pups have made their mark over the last decade of this animal cute fest. Enjoy new endearing highlights and action-packed plays every hour from PUPPY BOWL’s I-IX as we count down the best of the best and most memorable moments captured over the years in lists including Top 10 Puppies and Top 10 Goofiest Plays. Instagram Your Photos – All those PUPPY BOWL parties just got 10 times more fun! For the first time ever, viewers will submit their own photos (of themselves or their pets or both) via Instagram using #puppybowl all night long for a chance to see themselves and their best friends on TV in real time. It wouldn’t be PUPPY BOWL without America’s favorite referee, Dan Schachner, who returns to call the puppy penalties for his third year as “The Ref.” Sideline reporter “Meep the Bird” is back on his perch to tweet live updates and commentary throughout the big game. Fans can follow @MeepTheBird to catch the latest news, puppy drama and locker room moments from inside the stadium. After an electrical malfunction at that other game last year, “Meep the Bird” reminded viewers that the lights never go out at PUPPY BOWL. And this year, hamsters are working their wheels below the stadium to keep the lights on and the turbines running. Viewers won’t miss a second of the action with PUPPY BOWL favorites such as the water bowl cam, slow motion “Too Cute” cam, kiss-cam and an aerial view of the field provided by a blimp and its hamster pilots, capturing every furry fumble, touchdown and penalty. Outside the stadium, canine fans without tickets will claim their spots in the parking lot at a brand new tailgate party. Off the field, in honor of the 10th anniversary of PUPPY BOWL, Animal Planet in collaboration with the ASPCA® (The American Society for the Prevention of Cruelty to Animals®), is bringing the PUPPY BOWL EXPERIENCE live to New York City! Fans can join the celebration for the whole week leading up to the big game at Discovery Times Square, located in the heart of New York’s Times Square on 44th Street between 7th and 8th Avenue. The event will be held daily from Monday, January 27th to Saturday, February 1st. Please visit AnimalPlanet.com/PuppyBowl later this month for the daily schedule. Open to the public free of charge, visitors will get a chance to learn about the history of PUPPY BOWL during a walk through the Hall of Fame; enjoy live puppy action on the replica field featuring rescued pups from the ASPCA; and visit interactive booths including a tail-gate area with games and face painting, a “kissing booth” for a smooch from a lovable pooch, a chance to step into the press box to call a game, and much more. Guests will also get the chance to meet and snuggle some furry friends and even find a new family member at on-site adoption events hosted by the ASPCA with the Mayor’s Alliance for NYC’s Animals daily between 4 – 7 PM. Please visit Discovery Times Square’s website for the most up-to-date information including venue hours of operation at www.DiscoveryTSX.com. All of the puppies and kittens featured in PUPPY BOWL X come from shelters and rescue groups across the United States and even Puerto Rico. This year’s team includes players from Pasadena Humane Society & SPCA (California), Florida Little Dog Rescue, Colorado Animal Welfare League, Last Hope Animal Rescue (Iowa) and Scottsville Veterinary Hospital and Adoptions (New York). Animal Care & Control of NYC provided kittens for the KITTY HALF-TIME SHOW. Viewers interested in learning more about the organizations that participated in PUPPY BOWL X can visit AnimalPlanet.com for more information.